An incomplete silver Medieval penny of Henry VI (AD 1422-1461), long solid cross, dating to AD 1427-1435. Mint of Calais. Other reference: Finder's reference: path field, no. 20. Obverse description: Crowned facing bust. Reverse description: Long solid cross, three pellets in angles. 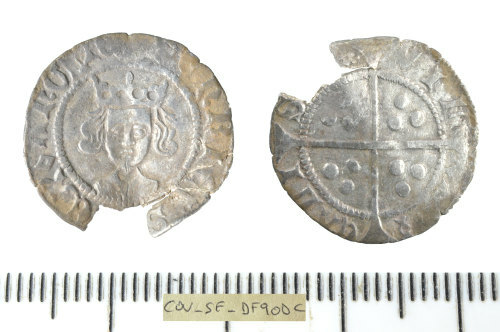 A medieval silver halfpenny of Henry VI. Annulet Issue, (1422-1461 AD), minted at calais 1422-1427 AD withers A3 (North 1435).